Living in a town with two universities and lots of international/private schools you get a lot of international students, which add an infusion of much needed variety into the style and fashion of this city. Having said this, however, there are somethings I will never get: like why arab guys insist on wearing armani/gucci/designer craziness... in the form of rindstones, gold lame, and labels oozing off their oddly discoloured jeans. 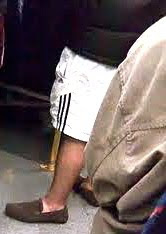 So, I saw this guys on my way home from work - and he is a perfect example of the aforementioned poor dress sense. I understand why you might wear a black puffy nylon down jacket and sports shorts if you had just come from the gym (and it was -10 outside). Unfortunately, I doubt this is the case here. The leather loafers and the Gucci baseball cap are just a hilarious combination by someone who is clearly trying (and failing) to look casually cool - why wear the Gucci hat if you weren't? Basically - it's too random and too try hard. Don't ever, ever, where a gucci baseball hat. I have never seen someone who looks cool or stylish wearing one. If you must wear a baseball hat, at least go for a traditional american sports team of some sort. If its actually cold wear some trousers, don't overcompensate with a giant coat. And finally don't pretend to "not make an effort" when choosing your outfit, when you blatantly and clearly care, a lot.